A decade ago while in college, I had a pretty neat summer job. I was working in Vancouver, rappelling off of high rise buildings with rope. At the time, companies who were utilizing rope workers used systems that were outdated, archaic and hazardous. Most companies had zero official training; with a lack of OHS understanding especially amongst the workers. The overall safety precautions of my employer were non-existent. 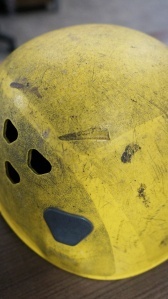 The simple act of wearing a helmet was considered ludicrous for rope workers in the industry; yet it was a requirement for various rope access trade associations globally. On this particular day, wearing a helmet saved my life. Despite the lack of consideration for safety precautions on the job sites I worked on, I made the choice to wear a helmet that met the ANSI standard for Industrial Head Protection. I knew the implications of serious head injuries and made a conscious effort to adequately outfit myself for work associated hazards. While pressure washing a 15-story building, I was struck on the head from above with a great force. Unable to see what had made contact with my helmet, I rappelled to the ground to assess the situation and found the 12 inch 'arrowhead shaped' concrete slab edge that nearly cost me my life. I checked the drop location and noticed the concrete slab had fallen from the edge of the 15th floor balcony above me. My wife, my family, my friends, my business. These would have been taken away from me. I can't imagine not having the opportunity to live the last 10 years of my life. The wedge shaped mark in the picture above was the result of the delaminated concrete falling onto my head. As I leaned over to pressure wash a wall area aside the balcony, my rope above must have loosened the edge of the concrete balcony above me. It is easy to see countless buildings around which are not maintained properly. The risk of internal building damages and insurance claims are high due to water ingress, and the risk of falling concrete are high when you allow structural rebar to corrode. Ten years later, the lack of concern for occupational safety still exists. In 2013, 11% of workplace fatalities are caused by 'trauma due to an object or equipment' (US Bureau of Labor Statistics). Overhead hazards can pose a severe threat with deadly consequences. Major incidents and fatalities can be avoided through hazard identification, implementing control methods and reassessing the scope of work to ensure a zero-risk site. When I walk through downtown Vancouver, it alarms me to see workers on a high-rise building without head protection. There are endless possibilities for hazards: from tenants dropping items from their balconies, or materials dislodged from the building, to the risk of another worker dropping an item over the roof edge; the conditions are unpredictable. Today and every day: I urge you to wear a helmet. It doesn’t take much effort, but it can save your life.